Make your loved one a sweet treat with these heart shaped Millionaires shortbread: crumbly biscuit sandwiched with caramel and drizzled with dark and white chocolate. 1. Preheat oven to 170°C, (150°C for fan ovens), Gas mark 4. 2. Cream butter and sugar with the vanilla until pale and fluffy. Add the flour and knead gently to a dough. Chill for 10 minutes. 3. Roll out the dough on a floured surface to the thickness of a pound coin and cut out biscuits (it should make 36 hearts, if you keep rolling and cutting). 4. Transfer to parchment lined baking sheets and bake for 8-10 minutes. Leave to cool. 5. Sandwich the biscuits together with a teaspoonful of caramel. Melt the chocolate in separate bowls. 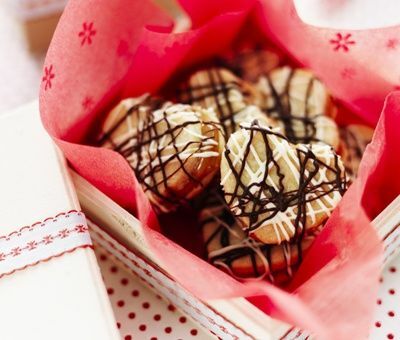 Drizzle the chocolate over the biscuits with a spoon or piping bags and leave to set. Enjoy with tea or coffee or pop one in your valentine’s lunchbox for a special treat! You can freeze the dough if you don’t want to bake it all at once. Wrap tightly in a double layer of cling film – it will keep for about a month. How long will these biccies last after baking? Hi Alexis - well not very long in the Carnation kitchen in our experience! :0) They will keep in an airtight box for about a week. If its a warm day keep in the fridge to stop the chocolate melting.